I didn’t think he could – but he has! I honestly didn’t think Dingo would be able to fit his concert in, have his Christmas party and then catch a plane to Bangkok all in one evening! Afterall, there’s a limit to what even he can do (or is there, I sometimes wonder!). However, he has managed it, because a couple of days ago, much to my surprise, I received a short email from him with the following drawing. He reckons he is too busy to write now, but he has asked me to wish everyone a very, very happy New Year in the meantime. So, until I hear from him, Cheers everyone! PS: He reckons he heard a joke on the plane that nearly made him choke! Well – what can one say! The picture says it all really! Talk about a triumph! As one commentator put it: “The Coronation and Kate and William’s wedding looked like small village Punch and Judy side-shows in comparison with this little lot!” The concert was originally scheduled for the Royal Festival Hall you may remember, but such was the demand that it was decided to hold it in Hyde Park. Just as well! London has seldom seen anything like it and it’ll never be quite the same again. Even the legendary Arturo Toscanini never received a reception to equal this! But now they’re off to conquer the Far East, so stand-by Bangkok – you have been warned. PS: A CD of this unforgettable concert will be available at all major outlets worldwide early in the new year. In view of the unprecedented demand for this historic recording, we strongly advise you to reserve your copy now by leaving your name and address on the contact page or under “comments” to avoid disappointment. Dingo and the boys have just asked me to wish everyone at WordPress a very, very Happy Christmas and a wonderfuol 2013. Dingo would really like to give each and everyone of you a present, but I don’t think this is a particularly good idea – afterall, who wants a bone or a dog biscuit in their Christmas stocking! Cheers everyone! It’s lovely being with you. H.V.Morton, the author of the famous “In search of…” travel books once confessed that when out walking he would sometimes stop and tease himself with the thought: “I wonder who stood here long ago?”. I must admit that although I don’t go as far as that, I do find it an intensely moving experience to stand on the very same spot where some great historic event took place. I suspect that there are quite a large number of people who share this very same trait on the quiet! For me personally, one of the most moving of such moments (and I have had several of them I am happy to say) was when I stood on the quarterdeck of the Victory in Portsmouth Harbour for the first time. Almost oblivious of the centuries, I was transported back to that wonderfully dramatic moment when this majestic 3-decker slowly broke through the combined French and Spanish line of battle on that early afternoon of the 21st October, 1805 off Cape Trafalgar. What an incredible scene it must have been. I went and stood by the famous hatchway and in my mind’s eye, saw Lord Nelson and Captain Hardy calmly walking towards me through the dense smoke from the thundering cannons. Nelson (he is only a few feet away now) stops a moment and turns round to look at the poop deck under which the giant steering-wheel is housed (see first picture). Captain Hardy, who had walked on alone a few steps, suddenly becomes aware that Nelson is no longer with him, stops too and looks around enquiringly, his eyes searching for his old friend among the seething crowd of gunners and marines who fill the confined space of the deck. Not seeing him at first, he re-traces his steps (it’s only a few feet) and finds to his horror the Admiral lying on the deck shot through the chest by a musket shot from the French 74 Redoubtable which is lying alongside the Victory – their lower yardarms entangled. To stand there on that actual spot was, for me, one of those moments which the poet Keats finely describes as being “big as years”. It was a long time ago now, but even so the smallest details have remained indelibly etched on my memory – so much so that at times I am almost tempted to think…! Yes, of course it is, but it does show how powerful the imagination can be when fed with the right ingredients at the right time! (besides – an ancestor of mine took part in the battle – even though he was press-ganged!). Anyway, a vivid imagination is almost as good as the real thing! It may not be quite so stirring, but at least it’s better than having a cannon-ball take your head off! 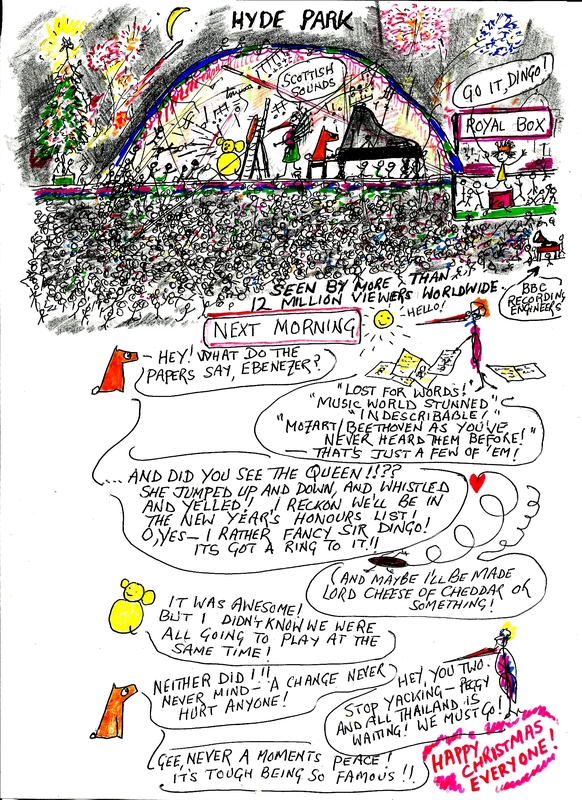 The latest instalment in the great Dingo Saga in which Dingo, Mousie and Sonnet discover to their great surprise and relief, that Ebenezer is not quite what he makes out to be! “Oh, what a thing is life! Well today and gone tomorrow. And how much the death of those around me, makes me prize every happy day that is granted to me”. Extract from Lady Anne Barnard’s diary. Friday July 4, 1800. Cape of Good Hope. Of the fight at Camperdown. She whispered: “Live the hour. Which glistens – and is gone”. On soft and silent toe. And the fight at Camperdown. Anne whispered: “Catch the hour. With dreams of long-lost days. Which glistens and is – gone”.